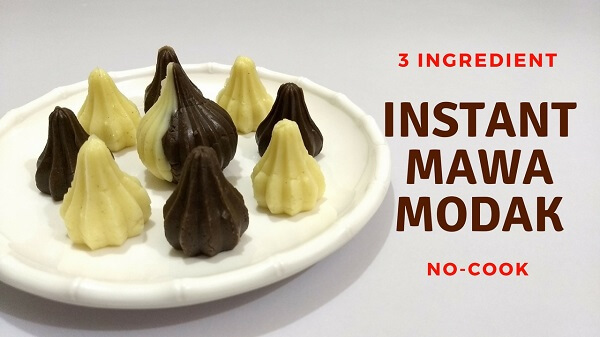 Instant Mawa Modak Recipe made with just three ingredients without cooking. 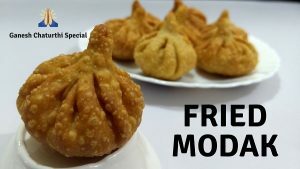 A quick recipe of Modak prepared ad Prasad or Naivedya for Ganesh Chaturthi. Here’s one more Modak recipe you can try this festive season. Modaks are a favourite sweet dish of Lord Ganesha and enjoyed by everyone especially during Ganesh Mahotsav. Add Mawa, Powder Sugar & Cardamom Powder in a bowl. Mix well until all ingredients are incorporated well, prepare a stiff dough. Take a small portion of the dough and put into the Modak mould. Spread evenly and press gently using your fingers. Level the dough and open the mould, repeat the process for rest of the dough. Add Mawa, Powder Sugar & Cocoa Powder in a bowl. Repeat the same process of Mawa Modak and prepare Chocolate Modak using the mould. Offer Instant Mawa Modak to Lord Ganesha during Ganesh Mahotsav as a Naivedya / Prasad. If using store bought Mawa/Khoa, heat on low flame for 2 – 3 minutes, cool down to room temperature and follow the above steps.